ELIJA EL ANTIRROBO ADECUADO. El nivel de seguridad que necesita depende de dónde y de cuánto tiempo va a dejar su bicicleta. ASEGURE SIEMPRE SU BICICLETA a un objeto sólido que no pueda ser levantado. ASEGURE SU BICICLETA en una zona bien alumbrada donde haya mucho tránsito de peatones. ASEGÚRESE de que el objeto al que vaya a atar su bicicleta no pueda ser cortado. ASEGURE SU BICICLETA SEGÚN EL VALOR: primero el marco, a continuación la rueda trasera, y por último, la rueda delantera. ¡CONSIGA UNA PROTECCIÓN SEGURA! A menor espacio en la cadena o candado en U, más difícil lo tendrán los ladrones para utilizar sus herramientas. POSICIONE SU ANTIRROBO lejos del suelo con la ranura hacia abajo. Vea nuestros vídeos sobre cómo asegurar bien su bicicleta tanto con una cadena como con un candado en U.
Puede que se presente el caso en que, debido a una estructura de protección con forma irregular, al tamaño de su antirrobo o el de su bicicleta, se vea limitado en lo que pueda atar con su antirrobo. En este caso, el marco deberá ser una prioridad. Mucho mejor que el Antirrobo solo para marcos, podrá atar el marco, la rueda trasera y el objeto inamovible con el mismo antirrobo. Es un método de protección muy popular con el que se puede atar el candado al marco, la rueda trasera y cualquier objeto inamovible. Asimismo, el candado en U sirve como anclaje para el cable de doble lazo que se ata a la rueda delantera. Este método es altamente eficaz y requiere el uso de dos antirrobos principales, ya sean cadenas, candados en U o una combinación de los dos. Uno de los antirrobos asegeura la rueda trasera y el marco a un objeto inamovible, mientras el otro antirrobo asegura la rueda delantera al marco. PRACTICE PROPER LOCKING TECHNIQUES! WHILE A FOLDING BIKE HAS MANY UNIQUE FEATURES, THE FOUNDATION OF PROPER LOCK-UP STILL APPLY. PLEASE LOOK TO OUR STANDARD BICYCLE LOCK-UP TAB FOR TIPS ON LOCKING PROCEDURE, AS WELL AS LINKS TO HELP YOU FIND THE RIGHT LOCK. 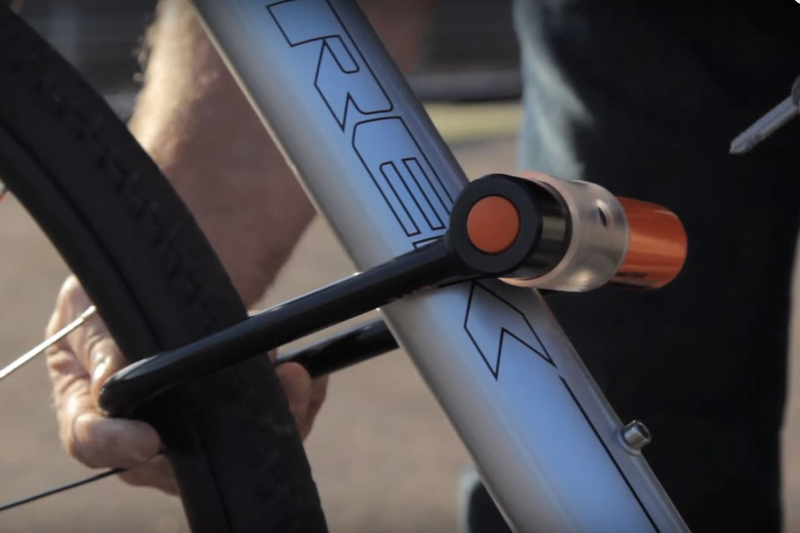 BELOW ARE SOME ADDITIONAL TIPS TO KEEP IN MIND WHEN LOCKING FOLDING BIKES SPECIFICALLY. When locking a folding bike that has been folded, we typically recommend using a chain, long shackle u-lock, or a folding lock. This will allow you to capture more components of the bike, often times the frame, rear, and front wheel along with the immovable object. Remember to remove any accessories like GPS units or lights before leaving your bike. PRACTICE PROPER LOCKING TECHNIQUES! WHILE AN E-BIKE HAS MANY UNIQUE FEATURES, THE FOUNDATION OF PROPER LOCK-UPS STILL APPLY. PLEASE LOOK TO OUR STANDARD BICYCLE LOCK-UP TAB FOR TIPS ON LOCKING PROCEDURE, AS WELL AS LINKS TO HELP YOU FIND THE RIGHT LOCK. 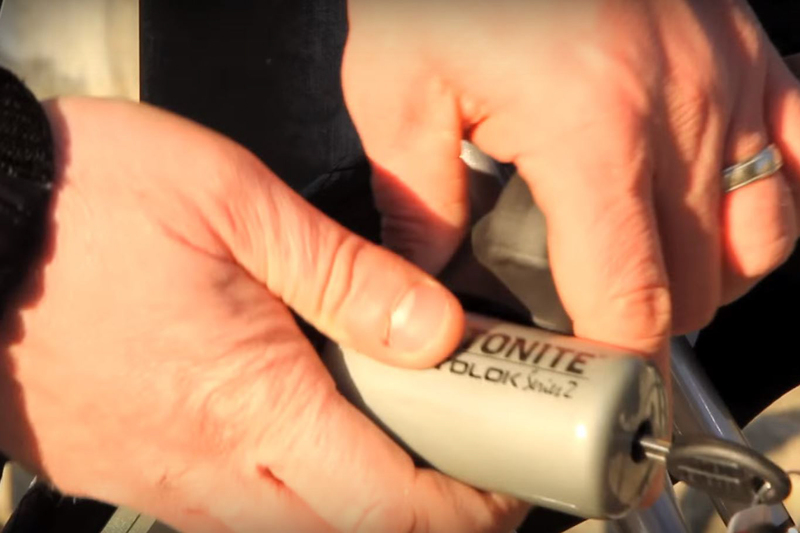 BELOW ARE SOME ADDITIONAL TIPS TO KEEP IN MIND WHEN LOCKING E-BIKES SPECIFICALLY. Many E-Bikes have a monitor, or cyclometer. Make sure to remove these if possible, and any other easily removable accessories before locking your bike. If convenient and possible, remove your battery and take it with you. Often times a chain can be preferable when locking an E-Bike. A chain provides flexibility to ensure you will be able to capture your frame and a wheel, especially when a wheel contains your electric motor. PRACTICE PROPER LOCKING TECHNIQUES! WHILE A MOUNTAIN BIKE IS A UNIQUE STYLE OF BIKE, THE FOUNDATION OF PROPER LOCK-UPS STILL APPLY, ESPECIALLY WHEN USING YOUR MOUNTAIN BIKE TO COMMUTE. PLEASE LOOK TO OUR STANDARD BICYCLE LOCK-UP TAB FOR TIPS ON LOCKING PROCEDURE, AS WELL AS LINKS TO HELP YOU FIND THE RIGHT LOCK. BELOW ARE SOME ADDITIONAL TIPS TO KEEP IN MIND WHEN LOCKING MOUNTAIN BIKES SPECIFICALLY. When on a ride, carrying a heavier lock isn’t always an option. It’s best to keep your bike in sight, and near you at all times when not riding. Carrying a cable can be helpful, to attach your bike to an immovable object, or another mountain bike, to prevent grab and dash theft, but is only a deterrent. It is important to lock your bikes while in transport. With some variation based on travel location, and duration of stop, we recommend using Ultimate Security products when possible. Make sure to lock to the most immovable object available. Installing a ground anchor, like the Stronghold, in the bed of a truck or trailer can work as a great immovable object. Locking your bike at home is crucial, especially with high value mountain bikes. Garage doors are not as secure as you may believe and are easily violated. We recommend an ultimate security lock to an immovable object. A ground anchor like the Stronghold can work great as an immovable object. Be careful about sharing your riding schedule and bike on public social networks. Thieves may use social riding apps to watch where a rider with an expensive bike, starts and ends their rides to pinpoint the location of where the bike is stored. If possible, start and end your rides from varying locations. PRACTICE PROPER LOCKING TECHNIQUES! WHILE A ROAD BIKE IS A UNIQUE STYLE OF BIKE, THE FOUNDATION OF PROPER LOCK-UPS STILL APPLY, ESPECIALLY WHEN USING YOUR ROAD BIKE TO COMMUTE. PLEASE LOOK TO OUR STANDARD BICYCLE LOCK-UP TAB FOR TIPS ON LOCKING PROCEDURE, AS WELL AS LINKS TO HELP YOU FIND THE RIGHT LOCK. BELOW ARE SOME ADDITIONAL TIPS TO KEEP IN MIND WHEN LOCKING ROAD BIKES SPECIFICALLY. When on a ride, carrying a heavier lock isn’t always an option. It’s best to keep your bike in sight, and near you at all times when not riding. Carrying a cable can be helpful, to attach your bike to an immovable object, or another road bike, to prevent grab and dash theft, but is only a deterrent. Locking your bike at home is crucial, especially with high value road bikes. Garage doors are not as secure as you may believe and are easily violated. We recommend an ultimate security lock to an immovable object. A ground anchor like the Stronghold can work great as an immovable object.